I don’t know why but I’m craving potato gratins these days. Stella’s mom likes to make it for me and lately with the pregnancy, she has been feeding me those so much! Everytime I get a surprise text from her, my heart flutters. “Darling, I made your favourite dish. Come and pick it up later.” By far, my favourite kind of sms to receive. I’m sure she misses Stell (who’s based in London) but with the daughter treatment I’m getting, I say Stell should just stay in London. Bahaha. God bless Aunty’s kindness, seriously! “Anywhere that serves potato gratin,” I told Dean. We bounced a few choices off each other but somehow it was so hard to make a decision! All the places that serve potato gratin are pretty fancy. Since my feet have increased in size, slippers are my only choice of footwear these days and I’m pretty sure we’ll get kicked out. Dean’s face lit up too. So. Much. Faith. In. Wife. Meh… but I see his point. So we had a light casual dinner and went to the grocery store to get ingredients for our celebratory gratin. If you happened to be at the store tonight, yes… we were the 2 noobs standing and laughing for 10 minutes in front of the potato section because we had no idea which one to get. In the end, we just went with our guts. 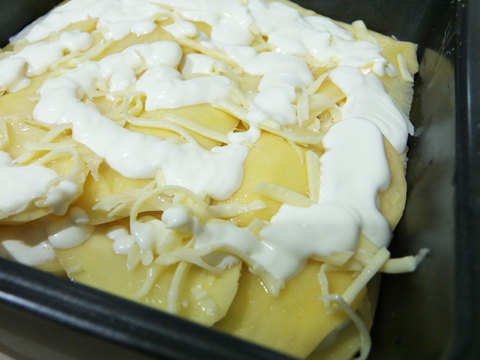 Arranged the potato slices into a layer, sprinkled salt, and added the cream and emmental cheese. We repeated the process till we got a few layers. 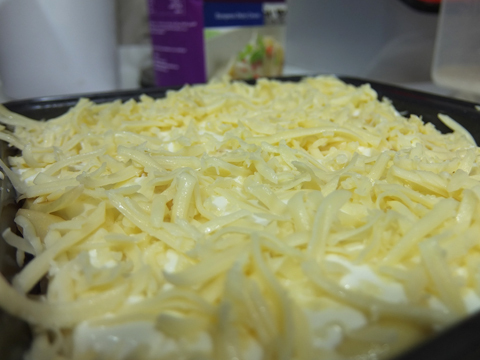 To top it off, lotssss of cheese. Yummmm! 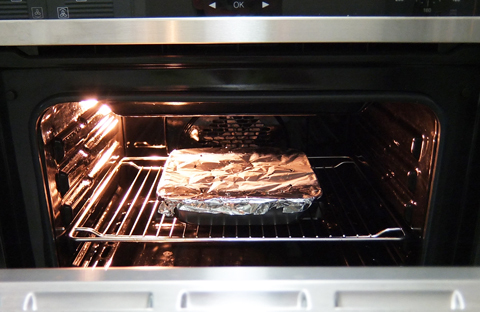 Covered the baking pan with foil. And off we went to the couch, put our feet up and watched The Voice. Neither of us remembered the potato until there was a burning smell. Haha. We tasted it and looked at each other. “How come it doesn’t taste like Aunty’s one?” was the message we understood from each other’s faces. 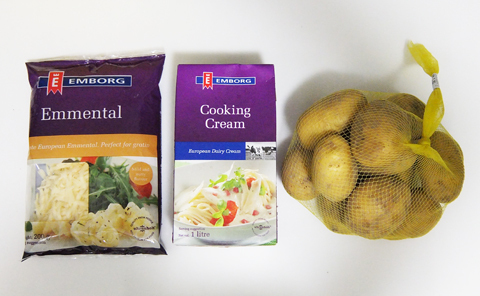 To be honest with you, we used too much cream and definitely bought the wrong potatoes I think. And we forgot black pepper. Good thinking going for dinner first. Haha. Oh what the heck. You guys weren’t there. The potato was deliciousssss and we’re amazing cooks! 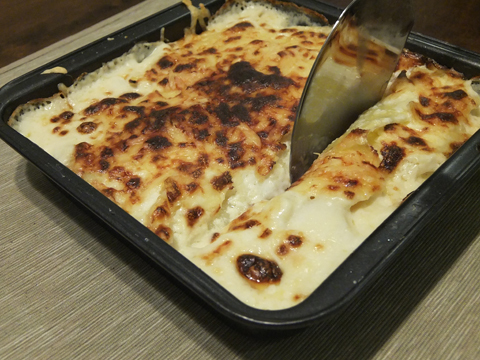 Disclaimer: There were no casualties in the making of this potato gratin. Haha just kidding. Dean cut his finger while slicing the potatoes. Had a bit of blood drama there. Happy 80th month anniversary, baby! I don’t think the type of potato matters for potato gratin. 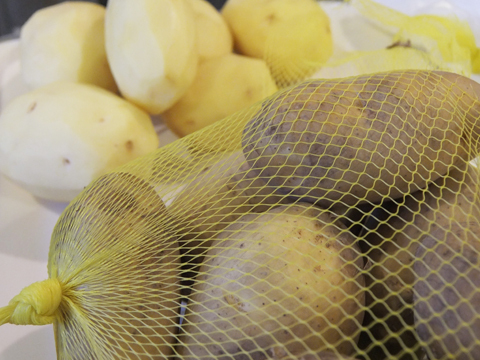 You should’ve boiled’em potatoes first so that they’ll be soft.. hehe! =) Now I feel like making one..Yummm! happy anniv to you guys!! Happy 80th monthversary Vivy and Fadza! Hands down, loved this post(!) I need to be a wee bit more consistent with my reading and keep up a bit A LOT more!! Argh. But congratulations on the 80th monthniversary and getting a healthy happy bouncing baby boy!!! :’D He’s absolutely beautiful.